This is definitely a really interesting topic to me, and I’ll try to answer to the best of my ability. Keep in mind that I’m coming at this from a psychology/biology background, not an anthropological one- I’d love to hear people from that field weigh in on the topic. I’d also like to note that some of the things in this article aren’t based on scientific research but my own observations and opinion. First, why do people keep pets? Because everybody loves pets- it’s not a recent phenomenon. In fact, it’s a prehistoric phenomenon. People have been found buried with pets at least as far back as 10,000 years ago and maybe further; the estimates for domestic dog domestication range between 18,000-40,000 years ago, and even before then humans may have taken wild animals from their mothers to keep as pets. People certainly still do it today. However, the vast majority of domesticated animals have been domesticated for purposes other than companionship- your cows, goats, sheep, etc. Dogs and cats played vital roles such as herding, guarding, and pest control, so they too are more the products of a symbiotic relationship rather than a purely emotional one. Domesticated pets like fancy rats and fancy mice that did not have a strict ‘purpose’ are often not bred merely for companionship, either; most of them have their domestic routes in breeding for shows or specific traits. This was popular in China for a long stretch of time (i.e., the goldfish, domesticated around 300 AD) and in Europe in the 19th century. This was a skill-based trade, in fact, and the animals served a much more ornamental than companion purpose. I’ll pause here and clarify what I mean by ‘domesticated,’ though, because I’m sure people are clamoring to argue at this point. While we may keep pets such as reptile, parrot, and amphibian species, most of these are not domesticated. At best they qualify as semi-domesticated or captive-bred. A domesticated animal is an animal that displays significant physical and behavioral differences from its wild counterparts and has adapted to life with humans. These adaptations include a docile temperament and an ability to thrive in large groups in small spaces. These traits are also found in ‘self-domesticated’ animals- for example, many island species evolve higher tolerance for their conspecifics as space is limited. A tamed animal, conversely, is one that resembles its wild counterparts in looks and behavior. Tamed animals often cannot be kept successfully as pets unless they are hand-reared by humans. In modern times, both tamed and domesticated animals are kept by humans for purely companionship purposes; however, I can’t think of a single animal that was domesticated only because it could be used as a companion. So in fact, I would consider the relationships between humans and domestic animals to all be either mutualistic or parasitic, and I wouldn’t consider them very distinct from other animal-animal relationships such as slavemaking ants etc. Not that companionship doesn’t have mutualistic benefits in and of itself, but I haven’t found an example where it’s been a strong enough factor to kick-start the domestication of an animal. But things are actually changing nowadays, especially if you look at some breeds of dogs. Many working breeds are actually losing behavioral traits that would make them less desirable as pets because the companion pet demand is stronger than the demand for working animals. Terriers, for example, were originally bred to kill rodents, which led to a highly excitable and somewhat aggressive personality with the tendency to bark. But many modern lines of terriers have much more docile and calm personalities than their ancestors did because those are not desirable traits in pet dogs. So you can in fact genetically affect an animal’s behavior to make it more companionable. But we don’t do that with a lot of animals we take in solely for companionship, i.e., tamed wild animals. In a lot of cases we obviously can’t, because we’re taking the animal right out of the wild. These animals probably won’t make orderly housepets. So why do we do it? Well, think about how you feel when you see a cute puppy. You want to pick it up and cuddle it, right? Easy. 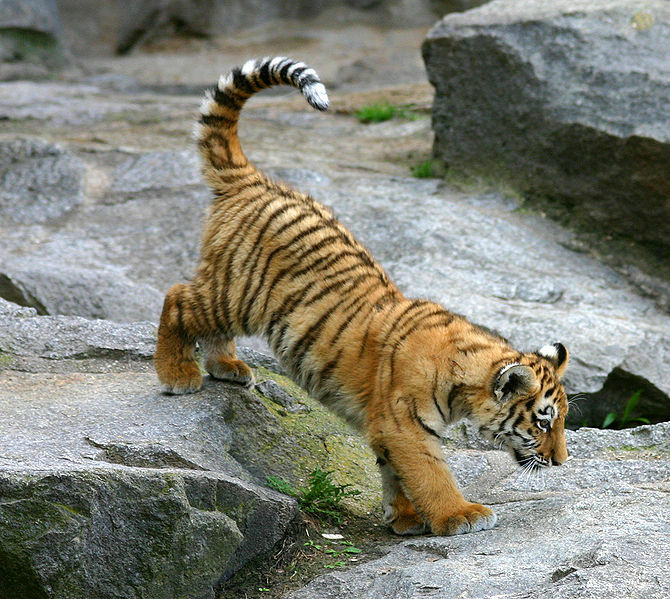 And how about when you look at this tiger cub? It doesn’t matter at ALL that this tiger would make a terrible pet and will grow up into a thing that can crush your head like an eggshell in its jaws. You want to pick this cub up and cuddle it. You are trying desperately to reach through your screen right now to pet it. And that’s the rub: humans like to care for things. Regardless of how stinky or destructive that thing is (and by the way, DO NOT KEEP A TIGER AS A PET), if it hits our ‘adorable’ button the right way, we want to hold it and keep it. This is an important instinct for humans, who tend to live in large family groups and often split up the work of rearing infants and children. We have to, since our offspring are dependent on us for such a long time and need so much attention. It’s not surprising since this strong instinct to give care (yes, for both females AND males) spills over to include animals. Particularly those with features similar to our own infants. This was probably true of very early humans that took animals out of the wild to care for: it simply feels nice to nurture something. And some of this also spills over into a desire for non-parental social companionship as well; we are social animals and we like interacting with other living beings. So, if it’s all that simple, will we find examples of cross-species nurturing in nonhuman animals? The answer, of course, is yes, but there are caveats. I think even the most coldhearted scientist would be unable to say that Koko’s interest in the kitten stems from anything other than the desire to nurture. And there are plenty of examples like this among captive great apes, like the orangutan Surya and his dog Roscoe. Surya was living at an animal sanctuary when the stray dog, Roscoe, approached him, apparently of his own volition. The two quickly became inseparable. Quite frequently domestic animals like dogs and cats are used as foster parents for orphaned wild animals. Cat and baby skunks? Why the heck not. There are even cases of wild animals taking care of domestic animals of their own volition, such as Moses the crow and Cassie the kitten. A family discovered the kitten in their backyard, apparently being fed by a large black crow. The crow continued to return to the yard to see the kitten for years even after the family adopted it. In some of these cases, the animals came together of their own volition; in others, the animals were introduced by humans. Either way none of them were completely ‘natural,’ which is to say, these animals were all getting fed steady diets and didn’t have much to worry about in the case of predators and competitors. Obviously, that takes a lot of strain off of what might otherwise have been antagonistic or competitive relationships. This suggests that there are conditions for companionable pet-keeping: first, a surplus of food and resources, so you can care for your not-your-species baby without worrying about your own health, and second, an introduction that leads to nurturing rather than killing. A lactating cat nursing her kittens is more likely to adopt a baby squirrel than a cat that is on the hunt for prey. Obviously, in the harsh wilderness, these conditions would be impossible to achieve, so there are no cases of wild animals caring for the young of other species… nah, I’m messing with you, of course there are. The most famous is probably Legadema the leopard and the baby baboon, which is a shame because it’s the shortest lived of all the examples I know of. In this case, Legadema the leopard killed a mother baboon and came across its newborn baby. Rather than killing the baby, Legadema played with it, licked it, and then took it up into a tree with herself to cuddle with it. The baby died that same night due to exposure. This is an interesting case, because Legadema’s behavior did shift back towards being predatory a few times during her care of the baboon, so it wasn’t a clear-cut case of pure nurturing instinct. An even more interesting case is ofthe lioness Kamunyak and the baby oryx. These relationships were mutually unhealthy; the oryx calves could not nurse from Kamunyak and Kamunyak could not leave them to hunt for herself, so both parties were starving. And Kamunyak did show similar behavioral switches as Legadema did- moments where she would suddenly run and knock the calf over. But the case still shows Kamunyak’s strong desire to nurture another species, even the same species each time, like a fixation. These incidents are arguably still not pet-keeping in some people’s minds because they do not last for very long (though if you ask me, three months is a decently long time) and because the two pairs did not directly share food. In that case, I’ll discuss a much more compelling example- Fortunata the marmoset and her adoptive family of capuchins. While marmosets and capuchins are both primates, they have significantly different eating habits, parenting styles, and mating styles. Marmosets are also much smaller than capuchins. The capuchins showed up to a research feeding station one day with baby Fortunata in tow. She was treated much like a capuchin baby, passed around from individual to individual. And yes, they shared their food with her, and yes, she successfully grew up and stayed with the group for over a year before separating from it (hopefully to join more marmosets and not because of predation). This case is interesting because, as the researchers reported, Fortunata acted infantile for longer than marmosets usually do, probably as a way of maintaining care from her adoptive family. They didn’t treat her quite like a capuchin monkey, either- even when she became an independent adult they all still tried to hold her (which she apparently didn’t like). To sum it all up: what do these examples prove? Not a thing really, at least scientifically. You’d need a consistent, testable pattern of pet-keeping within a species to really prove it exists. And before that people would have to agree what pet-keeping actually is. I still hold that it’s largely based on the desire to nurture and care for infants, but there’s a great deal of other reasoning out there. But while nothing is proven, to me all these examples suggest that many animals are capable of caring for members of other species purely for companionship given the right circumstances. If it’s not common, it’s probably because a) living in the wild is harsh obviously, and those circumstances don’t often arise, and b) not only are we not present for every interaction between animals, we scientists are actively looking for ‘normative’ behavior. Kamunyak never warranted a case study for whatever reason (despite the fact that her behavior continued and repeated for two years), and I’m sure there have been other examples of this type of cross-fostering that are ignored because they are considered freak accidents or what have you. I don’t think pet keeping became so common in humans for much more of a reason than we had several traits that easily allowed us to do it: first, past a certain point thanks to tools we were able to have a surplus of food, second, methods of pet-capturing and pet-keeping were easy to transmit culturally from generation to generation, and third and probably most importantly, we were highly social animals motivated to provide infant care as a group. We hit the pet-keeping lottery, so to speak. I’ll discuss one more example to close out, probably my favorite example of this phenomenon in wild animals. Like humans, the African wild dog is a highly social species where the entire group is motivated to feed and care for young. There was a case in the Mombo delta where a female wild dog, Solo, lost her pack and was isolated for some time. Solo was then seen caring for a small group of black-backed jackal puppies. Not only did she defend them, chasing away predators, she regurgitated food for them to eat. This is rather significant, as despite the fact that both species are canids, wild dogs are significantly larger and known to chase away and even kill jackals that approach them while feeding. In this case, however, the parent jackals were still around and helping to care for the puppies, so it’s not a clear cut case of adoption. The parents did tolerate Solo’s presence and started following her to kills. Later, when the pups were grown, Solo left this family and found another jackal family nursing their pups. She drove away the parents and began caring for the pups herself, again defending them from predators and regurgitating meat. If Kamunyak had an oryx fixation, Solo had a jackal fixation. But what’s weirder is that the story doesn’t even end there. Solo didn’t just become close with the jackals, she also became close with a hyena clan. Apparently Solo ingratiated herself in with a high-ranking female and was allowed to feed at the hyenas’ kills, even confidently driving away lower-ranking males so she could eat first. It got to the point where even Solo’s jackal family was tolerated to some extent while the hyenas were feeding. And it gets yet a little weirder: when Solo came into estrous, she even invited a hyena to mate with her. So Solo adopted jackal pups, but perhaps the hyenas adopted Solo? It’s hard to say. It’s certainly a bizarre and bewildering case. It definitely made me question my own rigid ideas of how animals in the wild interact with one another. But to sum it all up, I do think that animals in the wild are capable of forming relationships across species, with no ulterior motive aside from companionship. Wikipedia’s list of domesticated animals, which includes things like why they were domesticated and when. It’s not 100% infallible, but it’s a good starting place. Paper on the self-domestication hypothesis, specifically in bonobos. This is an entire volume of Anthrozoos, a journal focused on animal-human relationships, but of particular interest is the article “Pet-keeping in non-western societies: some popular misconceptions”. The published case study about Fortunata and her capuchin family. Trailer for the documentary about Solo the wild dog. Tagged animal behavior, anthropology, pets.